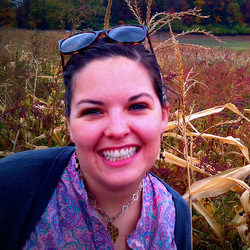 With backyard garden dreams like stars in our eyes, Neil and I began tearing up the sod in the backyard. We’ve torn up probably 500+ square feet of sod so far, making way for kitchen gardens, flower gardens, and a prairie garden. Thinking of getting rid of all that sod gave Neil an idea of building our compost bins out of some of it. As you may recall, our quick and easy winter compost situation was just to toss it in a steel drum that I found on craigslist. When the weather started to warm, we wanted a compost pile situation that was a bit less “trash fire” or “junk yard” looking. 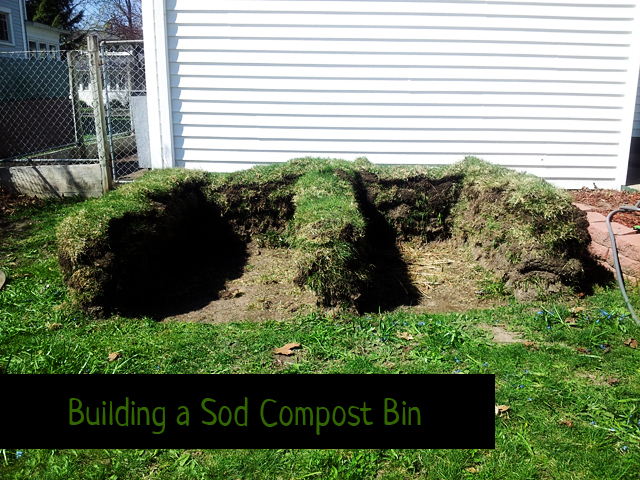 So Neil planned out and built a two-pile compost bin arrangement made of sod. And I want to share how we did it just in case you have plans to tear up a bit of grass for a garden and start a compost pile this spring or summer. Measure out the area that you want for your pile, and include 1 foot for each wall. length = 1 ft (left edge wall) + 3 ft (pile 1) +1 ft (center wall) + 3 ft (pile 2) + 1 ft (right edge wall) = 9 ft.
depth = 1 ft (front wall) + 3 ft (pile) + 1 ft (back wall) = 5 ft. Dig out the sod within your measured out area so you are starting out with a blank dirt rectangle. OK, this step is optional, because the walls and compost pile will kill all that grass anyway, but it does give you some sod to start building your bins out of. 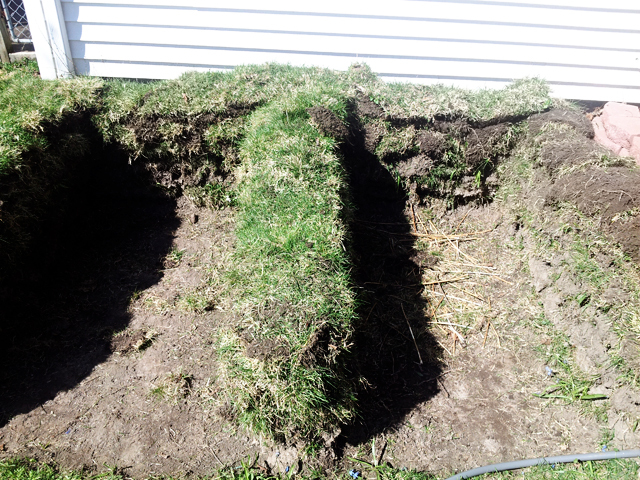 We dug out the sod beneath the bins using a square edge shovel. Tearing up sod is not an easy job, especially at this point in the spring when it’s had a good bit of time to re-establish its root system. When we cleared out the sod beneath the bins, it was the end of March, so the grass hadn’t really come back to life yet, which made this process easier. For the sod removal we did for our garden beds, we rented a manual sod ripper from a local hardware store. It was still tiresome manual labor, but it definitely went faster than working with a shovel. Rumor has it you can also rent gas powered sod rippers from Home Depot and the like, but our nearest Home Depot apparently doesn’t have a rental center. 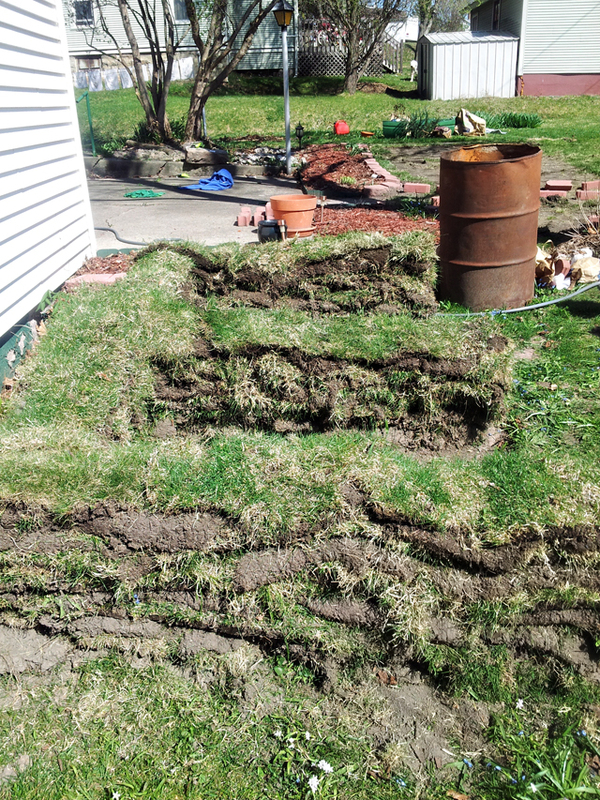 Build the back, side, and center walls out of sod using an alternating pattern. This means you face dirt side to dirt side and grass side to grass side. This is the pattern you use to stack sod to compost it as well. We also overlapped the sod layers so that the breaks in sod strips didn’t line up from layer to layer – you know, lego style. We built our walls to be about 2.5 – 3 ft tall. You may want to enforce your walls by making them a bit wider at the bottom than they are at the top. I did this by taking some piece of sod and leaning them along the bottom inside and outside of the wall. Build a shorter front containment wall. Our front wall is maybe only 9 inches tall. Its purpose is just to keep the compost pile from spilling out the front of the bin. You don’t want too tall of a front wall so that you have easy access to the pile for turning it and for retrieving your finished compost for spreading on the garden. Finish off your walls with a dirt-side-up layer of sod, and plant flowers or a vining plant on the top of the walls. This step is obviously also optional, but will potentially make for a prettier compost pile situation in the middle of summer. We planted some old nasturtium seeds we had along the top of our walls. Sod compost bins are certainly not a permanent compost situation. We’ll probably have to build new bins next spring or certainly by next fall. But they serve as multi-taskers for now: containing our kitchen and yard compost while also composting down some of the sod that we were tearing out of the yard anyway. When the sod walls have composted themselves, we’ll be able to use that as garden food as well as the compost piles the walls are containing. This entry was posted in house, living green and tagged compost, gardening, organic on May 21, 2015 by clare-admin.